There's nothing like getting a TapSnap picture taken while wearing your favorite hockey jersey. 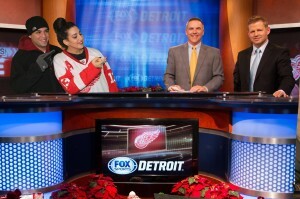 It's even better if you get a picture of yourself in the Fox Sports studio, and see what you’d look like behind the desk beside hockey sportscasters Chris Osgood (a former Red Wing star goalie) and Darren Eliot (also a former NHL player). That’s what fans visiting the Fox Sports Detroit booth had the chance to experience with TapSnap during the SiriusXM® Hockeytown Winter Festival from December 27 to 31. 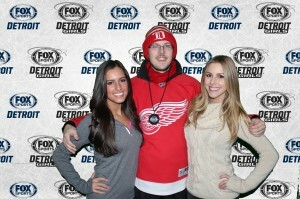 A second TapSnap machine allowed guests to pose with the Fox Sports Detroit Girls or the Fox Sports robot mascot Cleatus against a digital media wall branded with Fox Sports’ logo. They also used hashtags in TapSnap’s green screen image to launch a contest between the Fox Sports Minnesota Girls and Fox Sports Detroit Girls over which city is the best hockey city. Fans received a printout of their photo, and Raymond handed out cards directing fans to the Fox Sports Detroit Facebook page, where they could get a digital copy of their photo. The booth was part of the fun in the Coke Zero Fan Zone outside Detroit’s Comerica Park. Inside the stadium there were hockey matches galore: the Ontario Hockey League, the American Hockey League and a chance to see a New Year’s Eve game between alumni of the Toronto Maple Leafs and the Detroit Red Wings. But Raymond did leave to head to Ann Arbor, Mich. for the festival’s grand finale on January 1, the Winter Classic game between the Toronto Maple Leafs and the Detroit Red Wings, which set a new record with 105,500 tickets sold. Congratulations to Raymond and Anita Lousia on the birth of their lovely son Joshua Raymond Lousia late last year! Mother and baby are doing well.